Bernabeu side ready to sell Welshman to Old Trafford side. 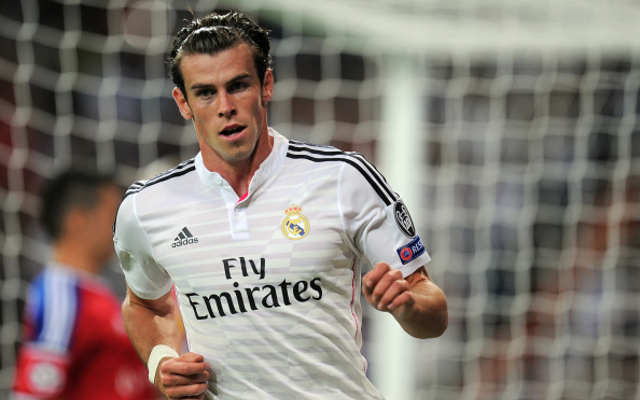 Real Madrid are ready to sell Gareth Bale to Man United according to the Metro. Speculation has been rife in recent weeks, linking the Welsh winger to the Old Trafford side, and now this source claims the Spanish giants are ready to sell the former Tottenham man. Bernabeu president Florentino Perez was apparently initially unwilling to sell the 25 year old but perhaps having seen his side defeat arch rivals Barcelona without the injured attacker he may have had a change of heart. Man United are ready to hand Bale a massive £300k a week contract and are lining up a world record £90m bid for his services. Bale has a superb first season in the Spanish capital, netting 22 goals and playing a key role in the club’s Champions League and Copa del Rey triumphs, but has perhaps had less of an impact in 2014/15. The summer arrival of Colombian James Rodriguez may well have led to Carlo Ancelotti having something of a selection headache, albeit a good headache to have. Ancelotti wil struggle to find room in his XI for Cristiano Ronaldo, Karim Benzema (who has only recently signed a new long term contract), the aforementioned Rodriguez AND Gareth Bale. If you add into the mix the good form shown by young Spanish international Isco then it does make the possibility of a possible Bale sale entirely plausible. The chance to follow in the footsteps of boyhood hero Ryan Giggs could well be added motivation for Bale and Louis van Gaal may feel he could do with another strong wide-attacking option with the likes of Luis Antonio Valencia, Juan Mata and Ashley Young all failing to make a consistent enough impact.